If you didn’t read HTS’s intro – check it out here. Heather slept-walked quite a bit, when she was young. She says that her family didn’t seem very concerned about it. Her mom would see her walking around, but since Heather always walked back into her room, her mom knew she was safe, so didn’t see any reason to intervene. As a teenager, Heather doesn’t recall sleepwalking, I imagine she thought she had outgrown this behavior. But, the episodes started again when she was in her mid-twenties. This was a stressful time, as Heather was going through a divorce. The sleepwalking didn’t stop though, after the stress of this event abated, and she has continued to sleepwalk ever since. Heather explains that there are two types of sleepwalking: the kind you can remember and the kind you never remember. Heather’s sleep walking used to be of the latter variety. In her mid- twenties she would have no memory of getting up and walking around at night, but she would know she slept-walked because of the clues she found in the morning. During this time, the obvious hint was generally the fact that she would go to sleep in her pajamas, but wake up with different clothes on. Interestingly, the garb she arose in was typically a dress she hadn’t worn in years. It was not always the same dress. She never awoke in something convenient or comfortable to put on, but always a dress from the far corners of the closet. From here, the sleep walking worsened, and it hasn’t gone away. Sometimes, Heather remembers events from her nighttime amblings in the morning, sometimes her memory is sparked by a clue left behind, and sometimes she has no memory of the nocturnal escapades at all. This makes it difficult for her to give a weekly average regarding how often she sleepwalks. Her best guess is at least twice a week, sometimes much more. She hasn’t found a connection between her sleepwalking and her times of either high or low stress. The only trigger that she is sure of is when she sleeps somewhere other than her own house. This doesn’t necessarily mean that she sleepwalks more when she’s sleeping at the new place, but more often than not, she will sleep walk upon returning home. She’s slept in the same bedroom for 14 years, so Awake Heather knows every nook and cranny, while Sleepwalking Heather is quite often confused about where she is. She’s found that cracking her curtains for a little light sometimes helps her orientation. As mentioned above, this is exacerbated after overnight trips. If she goes on a camping trip, when she returns she may sleep walk, thinking that she is still sleeping in a tent, or that she is fishing for crayfish. If she sleeps at a friend’s cottage, she might sleep walk and picture herself in one of the cottage rooms. This always means that the door is in a different place than the door in her actual bedroom. This stresses her out to no end, and she struggles to find the door (where there is none) in the middle of the night. Did you get a good mental picture of her banging on a dresser to get out of the room? Because that’s what she does. Sounds funny, but she says it is actually pretty scary. She doesn’t remember that her boyfriend is there, and that she could ask him for help, so she just panics, and sometimes cries, to herself. Sleepwalking Heather is often very confused about not only where she is, but also who she is with. She says it feels like she has temporary amnesia. One of the most disturbing things for her is waking up and not knowing who she is sleeping next to. She has been with her boyfriend for almost 7 years, but she often has to crawl over him and look at his face, because she is completely confused and disoriented. Once she sees his face she feels a huge amount of relief. Often times after returning from a trip with her friends, she wakes up and thinks that he is just a good girlfriend of hers. She says she will be laying there feeling incredibly embarrassed, because she thinks she went to bed with her friend, while naked, or, even worse, she thinks she is spooning with her friend. She does note, however, that she has never forgotten about her daughter, and says that she will often check up on her during her late night meanderings. She admits that her daughter doesn’t always appreciate this, especially when she wakes up to Heather standing on the ladder of her loft, just staring at her. Poor girl. A special thank you to Heather, for sharing her intriguing stories (and for writing most of this post, which I just tweaked, a bit). My friend Heather is a pretty amazing gal. She is one of those people you can always count on, always trust. She gets excited about the accomplishments of her friends, and cheers them on, and is never jealous or judgmental. She raised her young daughter by herself, while managing a restaurant and putting herself through college (even the unpaid, year-long, teaching internship). She is hilarious and witty and has an infectious laugh, and a toothpaste-commercial-worthy smile (ding!). She is incredibly crafty – she creates scrapbooks, homemade cards and wall art to decorate her country home. She sandwiches glass pieces around droll cards and print-outs, soldering the edges to create one of a kind ornaments and magnets. She enjoys sarcasm. And Miller Lite. She runs a freezer meal exchange group. She is an avid couponer, and could open up a general store from her stocked up wares in the basement. She organizes party buses for dozens of friends and designs costumes and props to keep her high school students entertained (she once dressed up like the Grim Reaper and created a “wheel of death” that the students had to spin, as an introduction to a bacterial and viral diseases research project). She is a member of a roller derby team. She loves margaritas and used books. She’s an all-around beautiful human being. 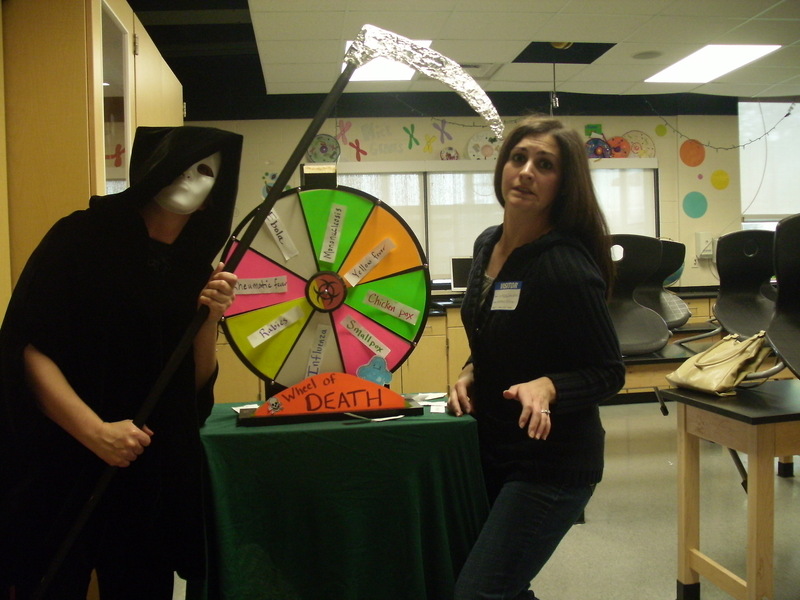 Grim Reaper, Wheel of Death and horribly-fake scared school visitor. BUT, the characteristic that makes her especially relevant to this blog is that she is a sleepwalker. I don’t mean that she slept-walked a couple of times in middle school. No. This is much more serious. She sleepwalks at least a couple of nights each week. And, she might not like me giving hints about her age, but she has been sleepwalking like this for over 25 years. After a month of me harassing her, to let me use her as blog material, she finally relented. My hypothesis is that she knows she is supposed to log her sleepwalking and sleep-related antics, in the hope of actually receiving some HELP one day, and maybe being fodder for my blog will make her do it. She did participate in a sleep study once, but since she was attached to numerous wires she said that she knew before going to sleep that there wouldn’t be a way for her to get up and walk around. Her sleepwalking self can spy on her awake self, and understands these things, so Sleepwalking Heather didn’t even try to roam the facility, and the doctors weren’t able to witness it. Since they didn’t witness her sleepwalking, the doctors said they couldn’t do anything. It sure seems like they were just setting her up for failure, doesn’t it? Maybe they just had no idea what to do to help, since they deal with mostly young children, and said they’d never had an adult report such extensive sleepwalking. Her sleepwalking adventures are always interesting. One time, she put on an old dress from the back of her closet, stood in front of her bedroom window, holding the curtain back and staring blankly outside for hours and hours. I’d imagine that may have been a smidge creepy to her neighbor across the street. Another time, when she was on a diet, she kept waking up to find that she’d eaten bowls of cereal in her sleep. She was really mad about this one. Heather The Sleepwalker will often hide things from Awake Heather, like her car keys (which go missing for weeks at a time) or her purse. The other day she awoke to find herself standing, alone, in her dark basement, holding in her arms all of the light bulbs she had unscrewed. Weird. I can’t wait to report further about Heather The Sleepwalker’s antics. Heather wrote down her most recent dream. See, she is starting to keep better track of her night time occurrences – I can now say that my blog is helping people who have sleeping disorders. S (boyfriend), T (friend) and I were at my parents house. We were very aware that the Zombie Apocalypse had begun. I remember telling S that if he came back to the house to be careful when he knocked, because my Dad may have “turned” by then. I was very anxious about not being able to find my purse. Finally, I gave up and told the guys that since I didn’t have my I.D. we would have to go to a local bar instead of out of town like we still planned (?). There were two cars waiting outside and T chuckled and told me to take the jeep. I quickly found out he might have been laughing because it had no brakes. I was speeding down Jefferson street and kept going from drive to reverse because I couldn’t get it to slow down and didn’t have much room on the road. Finally, I have a genius idea. I will get on the highway and slow to a stop there. But when I merge off the entrance ramp I realize that the highway is covered with zombies in varying states of decay. They are everywhere and they are fast! I speed up to 80 mph+ and still they are keeping up with me. This is also when I realize that on top of being alone in the apocalypse and having no breaks, my Jeep also has no top on it. I’m trying to sideswipe the zombies on either side of me but this only ends in them somehow getting suction cupped to my vehicle, which then promptly turns into a cruise ship (this made sense in the dream). So, now I am on a large cruise ship with a bunch of zombies. However, the zombies somehow realize that this is MY cruise ship so they are doing their best not to eat me. The big difference between the cruise ship zombies and the highway zombies is that these new ones are very well mannered an all seemed to be dressed for formal night on the cruise. They can’t seem to stop smelling me though and telling me how delicious I would be. I am shaking and calling S repeatedly to see if he is still among the living. Meanwhile, I see that the cruise ship zombies have lined up for dinner and a chef is taking their orders. One says, “One male please”, another says, “2 females please”, and I realize that they are ordering humans for dinner. a) What I initially find humorous about this is that when I imagine Heather sleepwalking, I sort of picture a zombie-like stumble. Don’t you? b) You should know that Heather is slightly obsessed with zombies. She read Pride and Prejudice and Zombies. She uses the zombie virus as a way to grab the interest of her students when teaching about infectious disease (she does have to point out to some students that it isn’t actually a real virus). She was excited about a locally hosted zombie walk – a curiously morbid fundraiser to raise food for the needy. 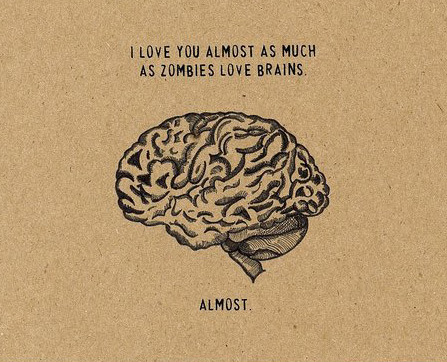 She makes homemade cards valentines cards about loving someone like a zombie loves brains. I’ll bet she has a zombie disaster action plan. I suggest she “like” the Facebook group “Stop Zombietis“, which is a group that marries the topics of zombies and sleep issues. She’s. A. Zombie. Freak. Just one of the many reasons why I love her. c) Heather’s coworker provided a solid interpretation of her dream. The zombies chasing Heather on the highway represents her 2nd hour class of freshmen, that she has indicated is one of the most difficult hours she has ever had, as a teacher, and the cruise ship zombies represent her 6th hour class of juniors and seniors, who are wonderful. Sounds pretty good to me. Heather told her 6th hour about the dream and now lovingly refers to the students in that class as her Cruise Ship Zombies. High school students love stuff like this, in case you didn’t know.